Training for a marathon isn’t easy, but it’s not impossible either. In this post, I show you how to apply proven management techniques to your goal of completing a marathon. After all, what kind of MBA would I be if I didn’t throw a little business theory at you? Take these steps as you embark on your training, and you’re bound to succeed! In a previous post, I shared several reasons why you might want to run a marathon. Whatever your rationale, make sure that marathoning aligns with your personal goals and values. Do you believe that you can complete a marathon? I used to hate running when I was little. I avoided it at all costs. If I had listened to the voice inside my head telling me that I wasn’t a runner, I never would have tried to run a marathon, much less discover that I really enjoyed marathoning. Believe in yourself and hold yourself responsible for achieving your goal. It’s time to get real. Where are you starting from? Are you able to run 6 miles without stopping? Are you a walker? Do you have any injuries? What’s the weather like where you live – is there a season or time of year when you’d prefer not to train? Where will you run? If you travel a lot, training on a treadmill is different than training on pavement. Identify any obstacles, so you can plan for them. Writing goals down increases your chances of succeeding. Write down what you want to accomplish, given your starting point, and why. If you need a template for goal setting, take a look at my previous post. Given your situation and goal, what is the best timeline and race for you? Perhaps it’s obvious because it’s tied to your rationale for running. The charity team I ran for only participated in one specific marathon. For others, it may be less obvious. Determine when you can start training. Most training schedules mandate 12 – 16 weeks of training, and you must be able to cover at least 6 miles without stopping before week 1. If you aren’t able to start right away, consider upcoming races within the next 6-12 months. Are finances tight? Look for smaller marathons near your hometown. A good way to find your race is by using the race calendar on the Resources tab. Note: The kick-start guide helps you assess your starting place and adjust your plan accordingly. Even though you are training alone, you need support. Tell everyone your goal. Connect with other marathoners through the Marathon Essentials Community page, Twitter feed or Facebook page. Enlist your family– have them meet you at a water stop or at the finish line of your first long run to cheer you on. Subscribe to the Marathon Essentials podcast, and I will keep you going step by step. Involving others will help you stay motivated and on track. Marathoning is a mental sport. Just showing up counts for a lot. According to behavior experts, It takes somewhere between 21 – 66 days for a habit to become routine. So stick with it! To expedite habit formation, develop a trigger. Pick a small ritual that you do at the same time every day just before you run. An example is hearing a cell phone alarm or shutting the garage door when you return home from work. Try to run at the same time of day during the week (if you can). It’s okay to take off from running if you’re injured or not feeling well. But stick to the schedule as best you can. Don’t give up! Note: More tips on staying motivated are coming soon! 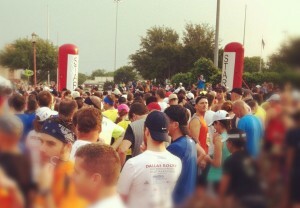 The journey to the starting line is just as big a part of the marathon as is the actual race. Celebrate your successes throughout your training. Share your excitement about finishing your first long run with our community through a tweet or a facebook post. Are you going to scream at the top of your lungs after your first 10 miler, like I did? Could you buy a new pair of running shoes or special running gear for your first 18 miler (it’s a good time to break in new gear before the marathon)? Go out for a big pancake breakfast with your family after your longest run. Have fun–you’ve earned it! You have better positioned yourself for success by just reading this article. Now take another step! Let us know which race you have chosen by leaving a comment below. Tracy, Brian. Goals! : How to Get Everything You Want– Faster than You Ever Thought Possible. San Francisco: Berrett-Koehler, 2003. Print. Matthews, Gail. Goals Research Summary. Dominican University of California. Web. 18 Apr. 2012. <http://www.dominican.edu/dominicannews/study-backs-up-strategies-for-achieving-goals>. Maltz, Maxwell. Doctor Psycho-cybernetics. North Hollywood, CA: Wilshire Book, 1971. Fogg, BJ. Fogg Behavior Model. Fogg Behavior Model. Web. 18 Apr. 2012. <http://www.behaviormodel.org>.